This Irish hymn tune is popular in many churches. This set of arrangements lets you grow into the advanced version (2'30") by offering several versions. Suggested fingerings and placing brackets are included. Lever changes and pedals are included. Scroll down for sample images (click to enlarge) and practice notes. If you aren’t quite comfortable with four note chords yet, learn the 26 string version first, at least the second page. Once you can play the three note chords on that page, go back to the four note chords in the lever harp or pedal harp version. Once you realize that you know the shapes of all the triads, you can add 4th finger and it’s easier for most people. There’s a free etude to help you work on inversions of chords if you need more practice with the student/teacher resources on this website. Start with the three note chords then move to the four note chords etude. The fingerings included here are suggestions to get you started. There are lots of other equally correct options. Decide what works for you and mark it on the music so that when you return to the music months after learning it you remember what you were doing. Leaving fingerings you don’t use on the music can make relearning things more difficult. Why so are many keys offered? My first choice is always to perform hymns in their original key, or one of the commonly used hymnal keys. Very often I hear people singing along as I perform and they can't do that well if the key is too high or too low. This is particularly important if I'm playing for someone who is ill when the extra effort of an uncomfortable key would not be soothing to them. 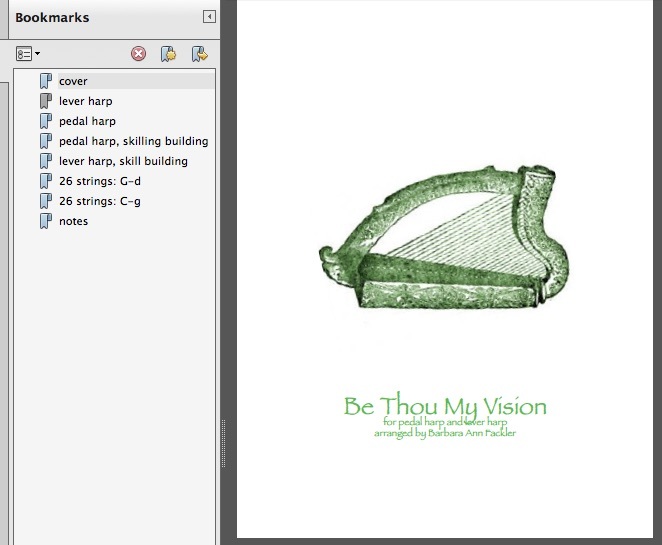 In this arrangement, the pedal harp solo ends in a commonly used key in hymnals. It can be performed as an introduction to congregational singing and will set up the hymn very nicely for the congregation. Because most lever harps are not tuned to have four flats available, the lever harp version is one step away, not too far to be out of easy vocal range but within the limits of a lever harp tuned in either C or Eb. Small harps add another level of complication with regard to keys and levers. Finding a key that allows for harps with partial levers and still fits the range of the instrument can be a challenge. in the case of this hymn, it was not necessary to change the key. Why not play everything in either C or Eb and move fewer levers? Most of us do not choose to live in a monochromatic world or to eat the same food every meal of every day. In the same way that we'd find that lack of variety monotonous, listening to the same key for hours on end can be monotonous, even irritating, for many people. Every key has its own character and color. Adding a variety of keys to your repertoire and even to individual arrangements adds interest for you and for your audience.